Lack of transmission infrastructure, increasing concerns over liquidity and financial health of power producers, and insufficient interest by developers has forced India to reduce the size of what was supposed to the largest wind energy tender in its history. The Solar Energy Corporation of India (SECI) finally issued the sixth edition of its national-level wind energy tender offerings. SECI had originally planned to offer 2.5 gigawatts capacity in this tender, making it the largest wind energy tender in India, however, only 1.2 gigawatts of capacity has now been offered. Capacity offered in the previous tender was also curtailed from 2 gigawatts to 1.2 gigawatts due to under-subscription by bidders. In the fresh tender, SECI will allow a single bidder to bid for as much as 600 megawatts, double the maximum allowed bid in the previous tender where 2 gigawatts of capacity was offered. The maximum tariff bid has been set at Rs 2.85/kWh (4.11¢/kWh). All other terms remain the same as the previous tenders. Bidders will be free to choose the location of the projects secured. Power purchase agreements shall be signed between the project developer and SECI, and the latter will in turn sign agreements with utilities across the country. SECI had offered 2 gigawatts of capacity in the previous wind energy tender but managed to attract bids for only 1.2 gigawatts capacity, and the tender was subsequently contracted to that capacity itself. The initial sixth tender was issued in late May 2018, and was later retracted. Last year, project developers communicated to SECI the lack of transmission infrastructure even for projects already allocated in auctions. Also last year, the Central Electricity Authority (CEA) approved transmission projects worth $56 million to support development and implementation of wind energy projects auctioned by SECI. 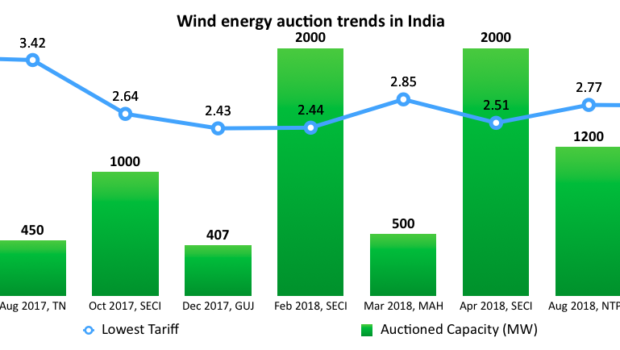 India has auctioned a total wind energy capacity of 9.8 gigawatts since competitive bidder in the sector was first introduced in February 2017. Six auctions, with 8.45 gigawatts of capacity, have been allocated at the national level — five by SECI and one by NTPC Limited. Three states — Tamil Nadu, Maharashtra, and Gujarat — have auctioned 1.3 gigawatts of capacity. So far, three companies — ReNew Power, Adani Green Energy, and Mytrah Energy — have bagged a total of 3.2 gigawatts of the auctioned capacity between them, which represents 32% of the auctioned capacity across India at the national and state level. ReNew Power leads with 1.22 gigawatts capacity in the bag, followed by Adani Green Energy at just over 1 gigawatt capacity.